No pictures today, just some talkin'. I'm trying to remember to stop by every few days to chat, but more often than not, realize that I thought about it, and realized I had something else to do. 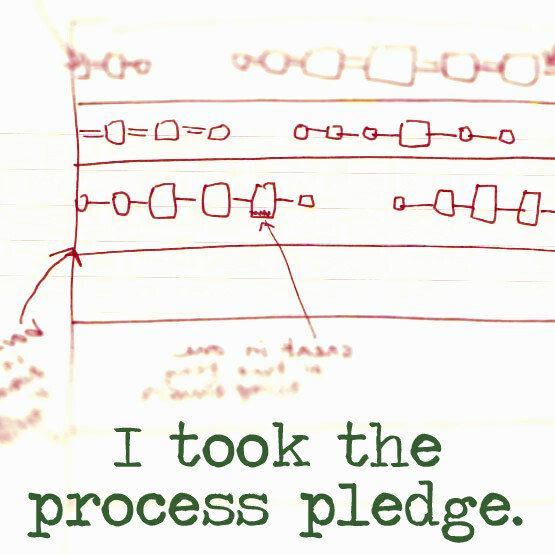 Making that pledge to be more open about my process right before the holiday....what was I thinking?! Anyway, yesterday I sat down with Stephanie's baby quilt to begin quilting it for real, and boy! Do I need some practice! My swirlys are lopsided and uneven, and my bamboo-ish filler design for the sashing is....leaving something to be desired. I'm sad to say that I think this quilt will go down as a FMQ practice quilt that I actually gave as a gift to a close friend!! Oh, the horrors! Currently, I am on a break after sewing for 15 minutes, trying to prevent sore muscles and frustration. Trying to figure out how to use my fingertips to move the quilt without having to pinch it up to move it. I wish I could steal snag borrow mom's sewing table; it has a nice hole to drop your machine into, leaving your quilt at the level of the needle, like a perfect extension table. I asked for a nice extension table for Christmas, not the $200+ full-sized sewing table, but the little attachments you can add when quilting. However, even if I do receive it (HINT HINT, I WANT THAT TABLE!! ;) it will not come before I have done most of the work for this quilt. Sadly, DH and I jury-rigged an extension table from a cardboard box and tape, but it's not a very smooth surface, so the quilt sandwich doesn't to move as nicely as it should. Anyway, my break-time is over, and I must return to the quilt for at least one more round before we call this evening a total KO. Eventually, I WILL defeat the process of FMQ, but it probably won't be tonight.